Currently still plowing my way through George RR Martin's A Dance with Dragons. Those books are good, but for some reason they take me forrrreeeever to read. See more pictures from the lake here. August 7: Beka and I have become really good friends over the past six months or so, and one day she drove to the city and we rode bikes and had dinner together! Both of our birthdays are in July, and we met and exchanged birthday presents. Also last month, I started a new Bible study (Beth Moore's Children of the Day) and Jordan and I switched Sunday school classes. This month, Jordan and I are taking a road trip to Mount Rushmore! Neither of us has been there before. We decided to drive the 13 hours from here to South Dakota, and I've got the route all planned out to stop at odd tourist attractions along the way. Mostly, I just care about seeing this. Also happening this month is Runners Tell All on the 21st. The topic is: your race bucket list. Write a post and link up! ooooh Mount Rushmore! Can't wait for those pics. It's a place I've always wanted to see. I'm looking forward to a friend's visit and a wine festival! This month I'm excited for my son Ryan to have his cast removed, and to celebrate his 10th birthday (how did that happen so fast?). Mount Rushmore is awesome - we went earlier this summer. Now I'm going to tell you ALL THE THINGS :) My suggestion would be to visit early in the morning. It's particularly majestic when the park is eerily quiet around you. Plus, it gets crowded quickly. I highly, highly suggest you make sure to visit the Badlands. About an hour (??) east of MR you'll come upon a 20ish mile loop through the park. Do it!! Western Nebraska surprised me with its beautiful landscape. The museum at the overpass in Kearney NE is really good. If you do drive to the Badlands, skip Wall, SD (you'll see a million signs for it - it's a strip of tourist trap stores) and try to tune into a radio station from a reservation. I wouldn't recommend staying in either Hot Springs SD or Sidney NE. is Jordan loving getting his picture taken now?? Have fun at Mount Rushmore! I loved Mt. Rushmore. I went when I was a kid. We were actually there for 4th of July and got to shoot fireworks off the mountain. It's absolutely beautiful! Omg, carhenge! I cannot wait to see photos of this. So amazing! Have fun on your road trip, road trips are the best! Cant wait to hear how you like Beth Moore's new study. your family is aweeesoome! haha. i wish i could travel for holiday sooner than later. I love game nights with friends, so fun! I have never been to Mount Rushmore, but adding a road trip to any vacation guarantees a good trip in my opinion. I'm looking forward to a lot of things this month, starting with visiting my grandparents this weekend. Did you know that Sunday is National Grandparents Day? Yep, it's a real thing! I did NOT know that! How fun! 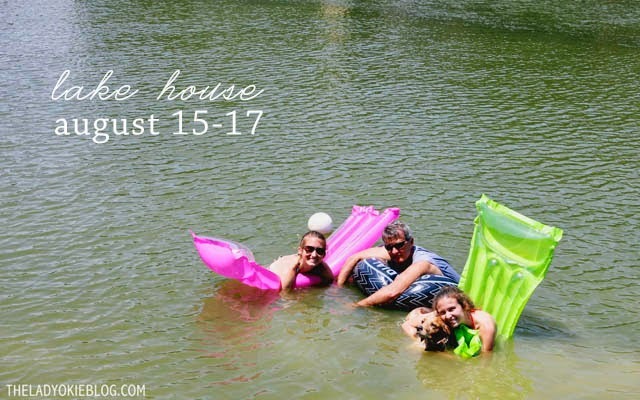 <3 that picture of y'all and oh my goodness the lake house!! ahhh i want to go haha. Hello fun month!!! College football with friends - yes please!!!! Who are you routing for? Well, here's the truth: since I grew up in Chicago, we don't really do college football in Illinois. Cuz we have the Bears :) But then I moved to Oklahoma, and hello people are OBSESSED with college football. I found myself leaning toward OSU just because OU fans are really obnoxious, but I don't really care either way. I just like it that everyone else freaks out about it. It's funny! A friend of mine told me about the book Stiff, but it sounded kind of creepy. Did you like it? Also, is it totally rude if I ask you what you got for your birthday? Do I spy some Virgil's Rootbeer? Mount Rushmore is so fun! We love South Dakota. You should stop by Tally's Silver Spoon. It's in Rapid City and so fun and delicious! I think you may drive through Keystone too, which is also really neat! Carhenge??? How did I miss that! I only made it to Rushmore. The GRRM books take me forever, too - because I skim through the chapters with characters I don't really care about, and then have to go back and re-read them because important things actually do happen in the middle of other things that, well, I don't care about. It reminds me of the Lord of the Rings series, when I wanted to skip past the Sam and whining Frodo parts to Aragorn and the battles. I'm not so dedicated a geek that I want to watch ALL the things. Mount Rushmore should be fun, though I've never been! 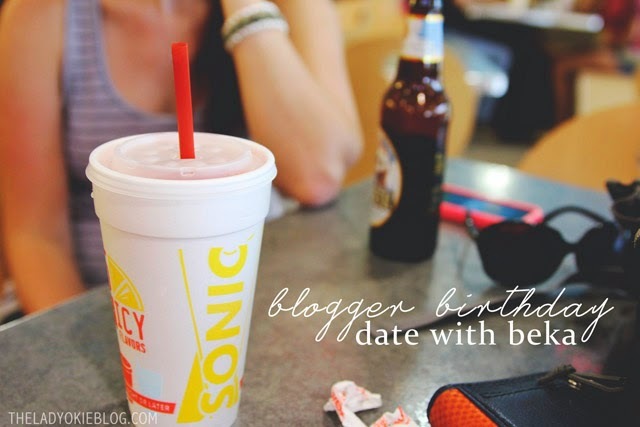 The blogger birthday meetup is awesome, glad you were able to do celebrate together. Great pic! You will have an awesome trip! There are so many random fun things to see out that way. We totally stopped by the carhenge place when we took a trip out to Mt. Rushmore. So fun! I believe we also went to a corn maze palace in NE. It was super neat. I haven't been to Mount Rushmore, but I really want to go! I love taking road trips; it's the best way to really see everything. I'm a little OCD about needing to know where I am and how to get around, so I prefer driving over flying any day. We want to drive out to Seattle (from MN), so Mount Rushmore is definitely a stopping point along the way for that trip - some day! Have a great trip! I so want to go to Mount Rushmore! Have a blast! Oh and I was in OKC last weekend and thought of you (not, like, in a creepy way)! It was a flying whirlwind of a trip but I hope we can meet up when I go back to the city at some point!! That picture of you guys is really cute :) You're such a natural beauty girl!! I went to Mt Rushmore as a kid and would LOVE to back with Jared as adults! And definitely do touristy stuff along the way... omg Carhenge?! That's so awesome! A roadtrip filled with various little side trips sounds like exactly my type of vacation. I went to mt. Rushmore probably 10 years ago. Never seen Carhenge, though, that sounds like exactly the kind of quirky thing that I'd have to plan a stop for. Carhenge! That looks fun! I hope you guys have a good trip. So, next year we will celebrate our birthdays together in Asia, right? I mean I did drive to OK so it will be your turn to come see me. ha! you guys are too cute ;) have fun with the GOT books - I tried and gave up, they just took forever for me to get into, so I gave up! I love your monthly recap posts! Have fun at Mount Rushmore! I've been twice...August 2002 and February 2013. Both were unexpected trips. You'd think that I'd have some tips for you, but I really don't. We stayed in Keystone on our February trip and ended up making several trips to Custer too. Carhenge sounds hilariously awesome! 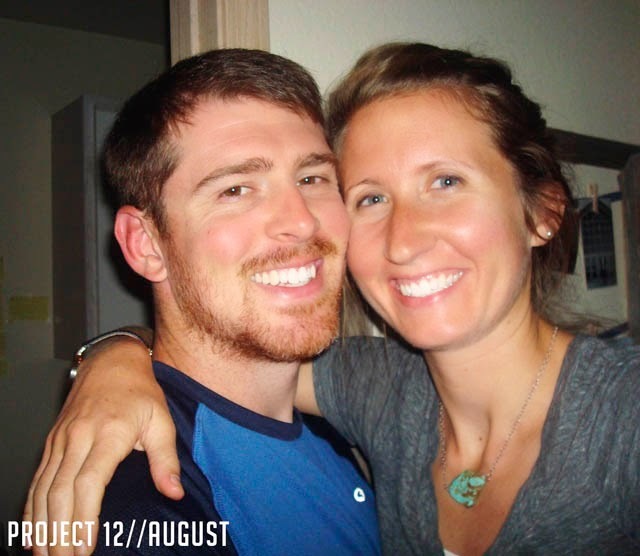 And I love that picture of you both for August--you look so happy! I'm definitely linking up this month for Runner's Tell All!